Expecting Monday. – Be bold. Italic. But never regular. Have you ever felt so much pain until you can’t feel anymore? Well I have. At first, it was like the world has falling apart. Fear, anger, hurt, confused. You hardly think about something good. Everything is like a dead end. You lost your happiness, your senses, your ability to think, and your selfconfidence. It’s alright. It’s a part of the process. I went through that 4 years ago. It taught me one hell of a good lesson. I grew stronger. Sometimes, I’m not really sure whether I really grew stronger, or became more bitter? If I grew bitter, I would feel so much hate. But I don’t. I don’t feel hate. It’s almost like, a numbness now whenever I thought someone is hurting me. Yeah, ofcourse I got angry or lost my temper sometimes . But after it’s being leashed, I hardly thought about it anymore. I know I still can feel and sense love. Oh so much love, towards people around me, things that I like. Lucky, I am surrounded by loving family and friends. Eventhough I offered them nothing but sincerety. I don’t buy them things, food or drinks, don’t really try to impress them, just being myself. And being honest about both my bad and good side. You see, I’ve tasted how it feels being mentally abused , hated, humiliated for years. How to deal with that? I simply think that they don’t know what they’re doing. And thank God until today I’m healthy and still living a good life. Some people went through worse or much worse. The first issue I had to overcome is : fear. When you’re being afraid, you can’t think. You have to control that. Especially fear of something that hasn’t happened yet. So many questions, and what ifs. It’s not an easy task. But everybody can do it as long as they don’t deny it. When you know how to control your fear, you’ll get calm. And after that, you can figure everything out. 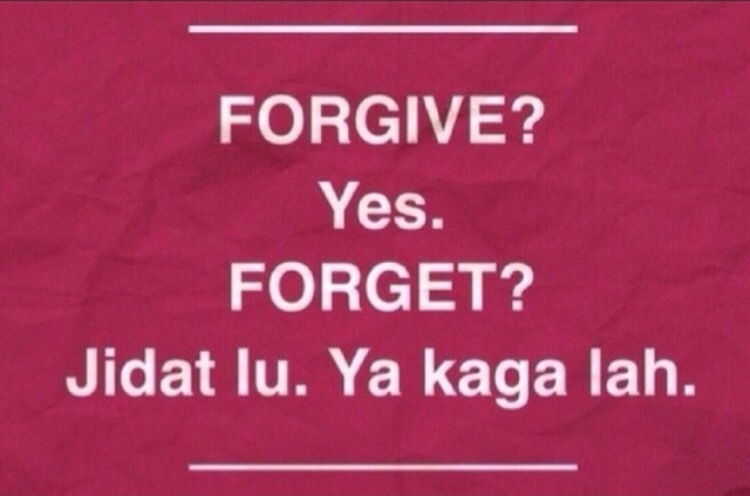 You forget your pain…oh well..Forgive, perhaps can. But I think nobody can really forget about their pain. They just make peace with that. And for me…that’s enough.